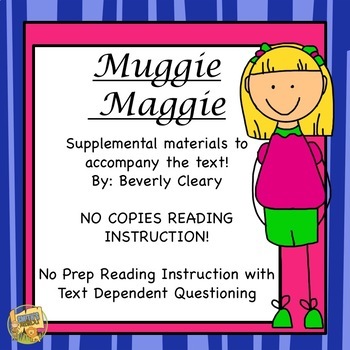 Muggie Maggie - NO Copies Reading Instruction! This packet goes with Muggie Maggie by Beverly Cleary. One day we had no paper and I started projecting the comprehension questions I had on a worksheet and I was hooked! Everything you need to teach this novel and best of all NO COPIES! The questions require the students to think about the novel and cite evidence from the text! Download the preview to see a sample of the pages included in the packet. 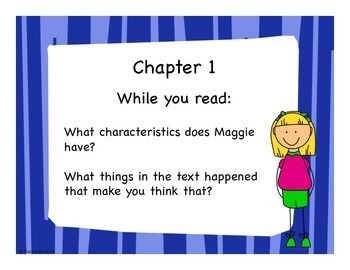 The preview has the writing prompt and 3 chapters of questions for you to look at. Want to receive email updates when I post new products, freebies, and SALES? Click the green star at the top to start following my store!